Owners Jeffrey and Cai Pandolfino have taken Green & Tonic from a delivery service to a plant-based dine on-the-go favorite with three Fairfield County locations and now a fourth location in downtown New Canaan location at 5 Burtis Avenue. Green & Tonic will offer their unique brand of organic cold-pressed juices, nutritional cleanse programs, meal plans, superfood smoothies, as well as a full menu of prepared foods including salads, side salads, wraps and soups all made fresh daily. The New Canaan store will also debut the new expanded breakfast menu, healthy kid-friendly snacks and a new store design. Green & Tonic hopes to engage the community in discussions about health & wellness "healthy happy hours", bringing in health professionals to address topics like nutrition strategies, natural remedies, sports nutrition, children’s health, and integrative health therapies. Designed by Scott Francisco, founder of Pilot Projects of New York City, the 850 square foot bright and open space has a contemporary design accented with the use of natural and environmentally-friendly building materials. Couches and chairs made with recycled materials, natural plants and sun light support the sustainable theme. Much of the organic produce and ingredients are sourced from local farms and regional artisans such as Back 40 Farm, Red Bee Honey, Satur Farm,and Hepworth Farm. "Many of our customers live in New Canaan so it was only natural to open a location here," says Jeffrey Pandolfino. "People in the area are health-conscious and focused on clean living. We hope to bring this philosophy to the mainstream market by making health and wellness a top priority for the whole family. Green & Tonic is an easy and convenient alternative for people to eat healthy while on the go to enjoy in a casual cafe environment, or to stock up for enjoying home. Green & Tonic opened its first location in Darien and Cos Cob in 2012, followed by a Greenwich Avenue location in 2013. Green & Tonic's accelerated growth is fueled by increased demand and overwhelming community support. TheNew Canaan location launches with a new design and updated branding which will be incorporated into the other locations. Plans for expansion in 2015 are under way and made possible by a significant growth capital investment made by a private individual in the Health and Wellness / CPG Private Equity space based in Greenwich, CT.
Green & Tonic is located at 5 Burtis Avenue in New Canaan. The hours of operation are Monday - Friday from 8am - 5pm and Saturday - Sunday 9am - 5pm. For more information, visit greenandtonic.com. Founded in 2011 by Jeffrey and Cai Pandolfino, Green & Tonic's chefs are experts in their craft, creating delicious and healthy foods and cold pressedjuice everyday. We are committed to serving the highest quality food, sourcing organic, non-GMO, locally-sourced and sustainable produced ingredients whenever possible. 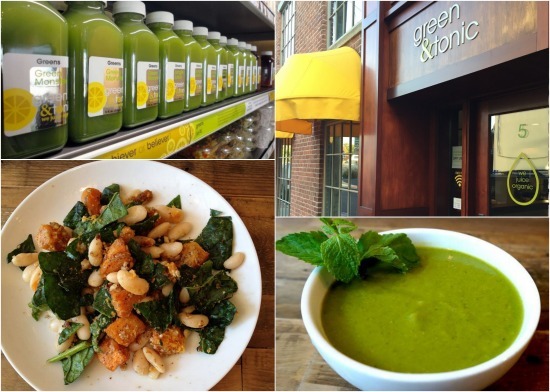 Green & Tonic's Connecticut locations are in Cos Cob, Darien, Greenwich and New Canaan. For more information, visit greenandtonic.com.